Name Variation John Arthur Blalock was also known as Arthur. John Arthur Blalock was born on 10 August 1904 at North Carolina. He was the son of Charles Edward Blalock and Katie M. Jackson. Alice Blalock was born on 7 August 1906 at North Carolina. She was the daughter of Charles Edward Blalock and Katie M. Jackson. Ruby Blalock was born circa February 1910 at North Carolina. Albert Blalock was born circa 1913 at North Carolina. William Henry Benton was born on 4 May 1874 at North Carolina. He married Nannie Frances Self on 2 January 1926. John Brogan was born in July 1895 at North Carolina. He married Sadie Irene Ellis, daughter of William John Ellis and Nannie Frances Self, circa 1920. James Melton Skipper was born on 9 April 1909 at North Carolina. He married Willie Mae Ellis, daughter of William John Ellis and Nannie Frances Self, on 16 November 1932. Gertrude Schiffman was born circa 1900 at Wisconsin. She was the daughter of Engelbert Schiffman and Sarah Beyer. [S243] U.S. Federal Census 1920 U.S. Federal Census, by Ancestry.com, ED123. Dwelling 101. 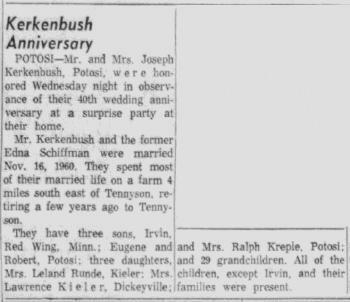 Married Name 16 November 1920 As of 16 November 1920,her married name was Kirkenbush. Married Name 16 November 1920 As of 16 November 1920,her married name was Kerkenbush. Edna Schiffman was born circa 1902 at Wisconsin. Edna Schiffman married Joseph L. Kirkenbush, son of Joseph Kerkenbush Sr. and Anna Gerhard, on 16 November 1920. 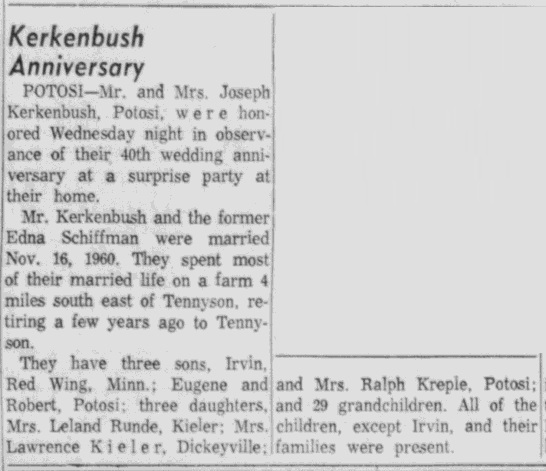 In November 1960 at Wisconsin Joseph and Edna (Schiffman) Kerkenbush 40th wedding anniversary. Name Variation Mabel Schiffman was also known as Mable. Mabel Schiffman was born circa 1904 at Wisconsin. Lorraine Schiffman was born circa 1907 at Wisconsin. Name Variation Harry L. Schiffman was also known as Harris. Harry L. Schiffman was born circa 1909 at Wisconsin. He was the son of Engelbert Schiffman and Sarah Beyer. Harry L. Schiffman married Dolores Christine Hinderman, daughter of Valentine Hinderman and Magdalena Thor, in November 1929 Harry Schiffman and Deloris Hinderman engagement announcement. Harry L. Schiffman died after 1969. Bernard Schiffman was born circa 1911 at Wisconsin. Jerome Schiffman was born circa 1915 at Wisconsin. Married Name circa 1926 As of circa 1926,her married name was Leibold. Augie M. (?) was born circa 1903 at Illinois. She married Edward J. Leibold, son of James Joseph Leibold and Elizabeth Schiffman, circa 1926. [S250] U.S. Federal Census 1930 U.S. Federal Census, by Ancestry.com, ED22. Dwelling 171. Frank Neenan was born circa 1886 at Iowa. He married Charlotte C. Leibold, daughter of James Joseph Leibold and Elizabeth Schiffman, circa 1914. Frank Neenan died before 1929. [S243] U.S. Federal Census 1920 U.S. Federal Census, by Ancestry.com, ED25. Dwelling 135. Married Name circa 1924 As of circa 1924,her married name was Leibold. Gertrude (?) was born circa 1904 at Wisconsin. She married George A. Leibold, son of James Joseph Leibold and Elizabeth Schiffman, circa 1924. [S250] U.S. Federal Census 1930 U.S. Federal Census, by Ancestry.com, ED22. Dwelling 170. Married Name circa 1882 As of circa 1882,her married name was Schiffman. Anna M. Beau was born in October 1860 at Germany. She married Edward Schiffman, son of Peter Joseph Schiffman and Gertrude Schwab, circa 1882. 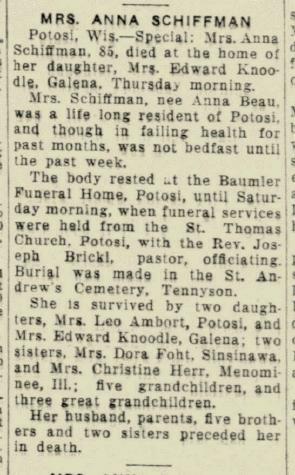 Anna M. Beau died in March 1944 at Galena, Illinois, at age 83 Anna (Beau) Schiffman obituary. Anna M. Beau had 3 with 2 living in 1900 children. She had 4 with 2 living in 1910 children. [S245] U.S. Federal Census 1900 U.S. Federal Census, by Ancestry.com, ED51. Dwelling 154. [S244] U.S. Federal Census 1910 U.S. Federal Census, by Ancestry.com, ED43. Dwelling 267. [S243] U.S. Federal Census 1920 U.S. Federal Census, by Ancestry.com, ED123. Dwelling 100. Name Variation Elnora C. Schiffman was also known as Nora. Married Name before 1916 As of before 1916,her married name was Turner. Elnora C. Schiffman was born in November 1890 at Wisconsin. She was the daughter of Edward Schiffman and Anna M. Beau. Elnora C. Schiffman married Oscar G. Turner, son of (?) Turner and Elizabeth S. (? ), before 1916. Elnora C. Schiffman and Oscar G. Turner were divorced before 1930. Martha D. Schiffman was born in June 1898 at Wisconsin. Oscar G. Turner was born circa 1885 at Wisconsin. He was the son of (?) Turner and Elizabeth S. (?). Oscar G. Turner married Elnora C. Schiffman, daughter of Edward Schiffman and Anna M. Beau, before 1916. Oscar G. Turner and Elnora C. Schiffman were divorced before 1930. Oscar G. Turner died after 1930. Giles E. Turner was born circa 1916 at Wisconsin. He was the son of Oscar G. Turner and Elnora C. Schiffman. Married Name Her married name was Turner. Elizabeth S. (?) married (?) Turner. Elizabeth S. (?) was born circa 1861 at Wisconsin. (?) Turner married Elizabeth S. (?). (?) Turner died before 1930. James R. Turner was born circa 1892 at Wisconsin. Anton Schiltz was born in 1820 at Luxemburg. Nicholas Delperdang Sr. married Josephine Stempert, daughter of Jean Pierre Stempert and Marguerite Viana. Nicholas Delperdang Sr. was born on 9 March 1829 at Belgium. He was the son of Michel Joseph Delperdang and Anna Mari Klaines. Nicholas Delperdang Sr. died on 23 February 1912 at Iowa at age 82. Married Name Her married name was Delperdang. Josephine Stempert married Nicholas Delperdang Sr., son of Michel Joseph Delperdang and Anna Mari Klaines. Josephine Stempert was born in 1830 at Belgium. She was the daughter of Jean Pierre Stempert and Marguerite Viana. Josephine Stempert died in 1872 at Iowa. Child of Josephine Stempert and Nicholas Delperdang Sr.
Name Variation Michel Joseph Delperdang was also known as Delperdange. Michel Joseph Delperdang married Anna Mari Klaines. Name Variation Anna Mari Klaines was also known as Kleines. Anna Mari Klaines married Michel Joseph Delperdang.